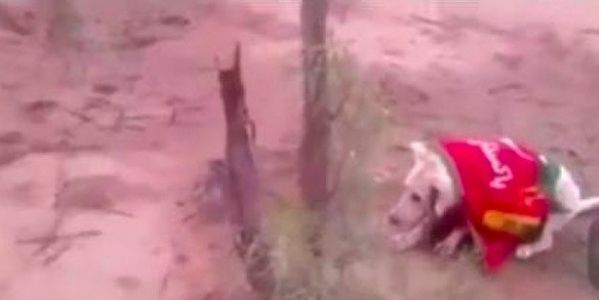 Last month, after the Pakistani national elections, disgruntled members of a losing party, found a dog, draped it in the flag of the opposing party, tied it to a tree and filmed themselves shooting the dog multiple times. A week prior, after the head of the political party PTI called supporters of an opposing party "donkeys", PTI's supporters attacked surrounded an actual donkey and beat it "to a pulp." According to witnesses, the donkey had been punched in the face and abdomen, it's nose was broken, it was covered in rope marks and a car had even plowed into its side. Animal rescuers found the poor being in a horrible state, but despite their efforts, it succumbed to its injuries and died within days. In most countries, showing support for your preferred party or candidate can take many forms: plastering a bumper sticker on the back of your car, donning a T-shirt emblazoned with your favorite candidate's name or participating in a rally or voter drive to help spread your party's agenda. But this year in Pakistan some political supporters took their support for their candidates to a horrifyingly cruel and deadly level. In Pakistan, animal abuse, especially during election season, is not uncommon. These are just two isolated incidents that were brought to light only due to social media, but other cases remain hidden. Unfortunately, Pakistan has no laws that protect animals from cruelty. This needs to change. While Pakistan's neighbors have at least a rudimentary framework to combat animal abuse, the country lags behind. These types of cases should not go unpunished and there needs to be modern laws that will protect our four-legged, finned and feathered friends from cruelty. Please sign the petition and ask Pakistan to take animal cruelty seriously. Ask the new Prime Minister, Imran Khan, to pass an animal cruelty law immediately.